Four UTAR Faculty of Engineering and Green Technology (FEGT) research projects by final year students made an impressive medal haul in the Novel Research & Innovation Competition (NRIC) 2015 held at Universiti Sains Malaysia (USM) from 15 to 18 August 2015. The four winning research projects consisted of two teams from the Faculty’s Department of Petrochemical Engineering, which bagged a gold medal and a bronze medal respectively, and another two teams from the Department Environmental Engineering. These two respective teams also took home a gold medal and a bronze medal each. Joining the competition for the first time upon invitation by the USM Student Representative Council, each research team was supervised by an FEGT lecturer. The participants were required to present their research work to the audience and selected panel of judges. All four research projects from UTAR stood out amongst a total of 146 research projects ranging from engineering to applied sciences by final year students from 14 local universities and two universities from Thailand. Petrochemical Engineering final year students Tay Yi Hui and Leong Weng Woh were over the moon when their research project titled “Development of Poly(vinylidene) Fluoride (PVDF)/Graphene Oxide (GO) Nanocomposite Membrane for Oily Wastewater Filtration” was announced as a gold medal winner. “Our research has successfully developed a membrane which shows increment in both water flux and rejection rate for oily wastewater filtration. This is a great step for industries such as petroleum and petrochemical which produce large amounts of oily wastewater and require filtration before discharging,” Weng Woh elucidated. According to the team, the method of fabricating the membrane has already been patented and the membrane has been commercialised by HVW Technologies, a Singapore-based company which provided financial support for the research. “We believe that the novelty, usefulness, and commercialisation of the membrane have met the main criteria of the competition, which contributed to our success,” Tay added. The research project was supervised by FEGT Head of Department of Petrochemical Engineering, Assoc Prof Dr Yamuna a/p Munusamy. 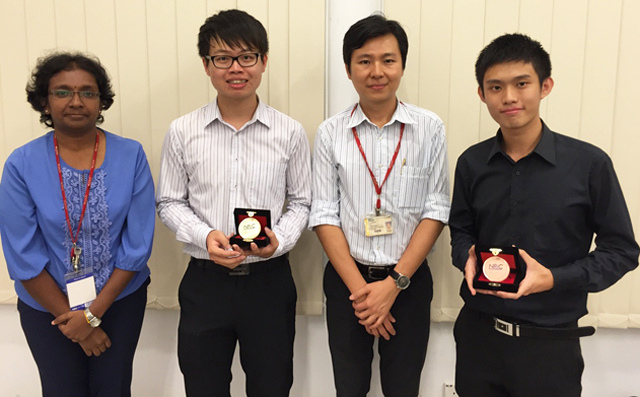 “Development of New Bio-filler for Thermoplastic from Waste Eggshell” was the other research entry from the Department of Petrochemical Engineering which earned students Chung Chen Seng and Lim Chin Aik a bronze medal. “Eggshell powder (ESP) has gained enormous attention in the polymer industry due to its high calcium carbonate content. This shows a great potential to substitute conventional mineral filler. 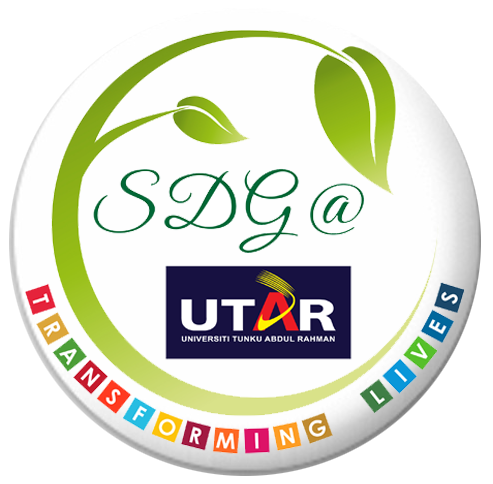 Moreover, due environmental concerns over sustainability, utilisation of finite resources for material science has shifted to renewable resources. Lately, plant-derived organic fillers are gaining public attention due to its low cost, low density, non-abrasiveness, biodegradability, recyclability, high specific properties and high fillings. Therefore, we used modified eggshell bio-filler to reinforce high density polyethylene (HDPE) polymer matrix. This newly developed composite has large potential to substitute calcium carbonate filler from natural resources which is commonly used in HDPE,” explained Chung about the research supervised by lecturer Dr Mathialagan a/l Muniyadi. “By using ESP as the substitution of conventional mineral filler, this may help to reduce the great amount of eggshell waste generated by the food processing industry,” Chin Aik added. 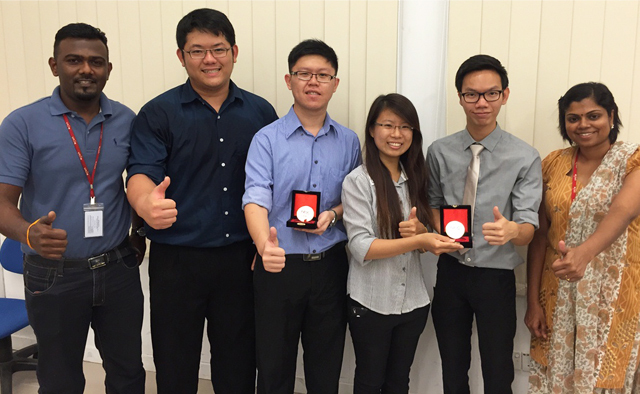 Environmental Engineering students Leong Wai Lun and Lim Ping Feng won gold and bronze respectively. Wai Lun’s research titled “Adsorption of heavy metal using palm oil sludge bio-char prepared by pyrolysis” converts a problematic industrial waste into a value-added product which could simultaneously solve water contamination. “Malaysia is the second largest palm oil producer in the world but this has rendered enormous amounts of waste generation annually. One of the wastes is palm oil sludge (POS) which causes pollution if disposed inappropriately. Furthermore, heavy metal pollution from industrial wastewater has also created an alarming situation in reutilising wastewater as drinking water. Therefore, in this project, POS is modified into a value-added product and tested for its capacity to remove heavy metal from wastewater. POS will be carbonised to form a carbonaceous inert material known as biochar. This product is neither available in the market nor reported in the literature. Moreover, if compared to similar products, it shows better removal quality of certain heavy metal. To top it all, biochar is much cheaper than powdered activated carbon and requires less energy to produce. In a nutshell, this product helps to create a sustainable environment by eliminating waste and reutilising the waste to lessen soil and water contamination,” Wai Lun said, who also thanked Head of Department of Environmental Engineering Dr Sumathi a/p Sethupathi for supervising his project. Ping Feng’s “The Performance of Air Cathode Single Chamber Microbial Fuel Cell (ACSCMFC) with different Sludge Retention Time (SRT) and Powdered Activated Carbon (PAC) Concentrations” supervised by FEGT Deputy Dean for Academic Development and Undergraduate Programmes Dr Ng Choon Aun, highlighted that microbial fuel cell technology had existed long ago. “It can produce electricity whilst removing the organic pollutants in wastewater by using oxidation and reduction processes. In my research, I discovered that electricity production and organic pollutant removal efficiency were increased with the addition of PAC and prolonged SRTs. Cost of energy is always a pressing issue especially to the industrial sector. Gallons of wastewater are produced daily and most of the time, they must be treated before being discharged into the environment such as rivers. However, the facilities to treat wastewater are costly. Hence, I strongly believe that people are convinced that microbial fuel cells can be an alternative where the electricity produced can offset the treatment operation cost and treat the wastewater at the same time,” Ping Feng said.